An NHS trust has admitted superimposing an image of a government minister into a publicity photograph for a hospital building project. Culture Secretary James Purnell was late for the photo at Tameside General Hospital in Greater Manchester, turning up after three other MPs had to leave. The MP agreed to have his photograph taken in the same spot, but says he did not agree to the images being merged. The trust has apologised to anyone who may have been misled by the picture. The image was sent out to a number of local newspapers in Greater Manchester and was published in at least one. Local MPs David Hayes, Tom Levitt and Andrew Gwynne all turned up in time for the photo call, organised by the Tameside and Glossop Hospitals NHS Trust. They were photographed at the construction site for a new building alongside trust chairman Kevin Corscadden and chief executive Christine Green. But Mr Purnell, the MP for Stalybridge and Hyde, was late for the photographer because of his "hectic ministerial schedule", the trust said. The MP told BBC news that there had been a "misunderstanding" over the picture and that the hospital had acted in good faith. "I thought it would be done in a way that made clear that I had arrived later and the picture was a slightly different one, for example having an insert or something like that," said Mr Purnell. "As I say, I didn't see this picture and if I had done I wouldn't have approved it going out. "I didn't think a faked photo would be produced and indeed I didn't see this photo before it went out and if I had done it wouldn't have agreed to it." A statement from the hospital trust appeared to contradict Mr Purnell's version of events, stating that that he had agreed to the faked photo. "All four of the local MPs of Tameside and Glossop have been highly supportive of the new building project, which will greatly improve facilities for patients and staff at Tameside General Hospital," said a spokesman. "Unfortunately, due to his hectic ministerial schedule James Purnell was late for the photo-shoot, and arrived shortly after the other MPs had to leave. "All the MPs had gone to great efforts to show their support, and as we would not be able to stage a repeat of this historic day for the hospital, we decided to take a photograph of Mr Purnell in the same spot very shortly after, and merge it with the earlier photograph, to which Mr Purnell kindly consented. "We apologise if anyone feels misled by this, but we took the judgement that the image of all our MPs on site supporting this excellent new project, was too good an opportunity to miss." Mr Purnell, 37, was appointed Secretary of State for Culture, Media and Sport in Gordon Brown's first Cabinet in June 2007. During the 2005 election, the Conservatives were heavily criticised by Labour after one of their candidates doctored a campaign leaflet. 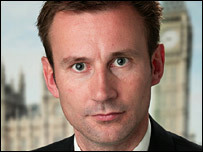 The Shadow Culture Secretary Jeremy Hunt called for an apology and said the picture row made Mr Purnell's position untenable . "Here is cast-iron proof that Labour ministers are quite happy to 'fake it' if they think they can get away with it," said Mr Hunt. "Mr Purnell went public with this picture. He must now make a public apology at the very least."